In what was a completely unexpected find (at least for me), the dusty store fronts of Dhaka hide a treasure trove of maritime salvage. The owners of the stores will tell you that this hails from the ship breaking yards of Chittagong, and a lot of it probably does. An impressive number of ships make Chittagong their last port of call — all told, the yard accounts for around a fifth of the world ship breaking industry. And the fancier bits broken off from these ships reportedly end up in stores across the country. A quick review of the usual inventory includes collections of bulkhead lights, compass housings, weather devices for measuring windspeed and direction, and brass finishings. All at remarkably reasonable prices, assuming that you are willing spend the money to ship your bit of the royal navy home. This is all mixed in with an impressive number of nautical "antiques": pocket compasses reportedly from the 19th century, sextons, and pocket telescopes. These look surprisingly realistic and are even passed off as authentic. However, there has been an unfortunately oversight in at least the compasses’ production that reveals them for what they are: modern knock offs. The compasses have a date stamped on their front — generally sometime between 1870-1890. Inscribed inside, they all have the same poem, Robert Frost’s “The Road Not Taken”. This is all a very nice touch, but Frost didn’t publish the poem until 1916…nearly 30 years after the compass was supposedly created. Looking beyond these well produced modern trinkets, these stores also hold a fascinating collection of things that you probably don't need but would look great hanging on your wall. 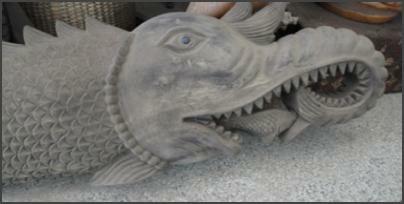 Here for example, is a lovely sculpture of the hindu mythical sea creature Makara reportedly salvaged from a hindu temple. To give credit where credit is due, this sculpture was discovered and photographed by my fellow intrepid urban explorer, Chelsea Wood.